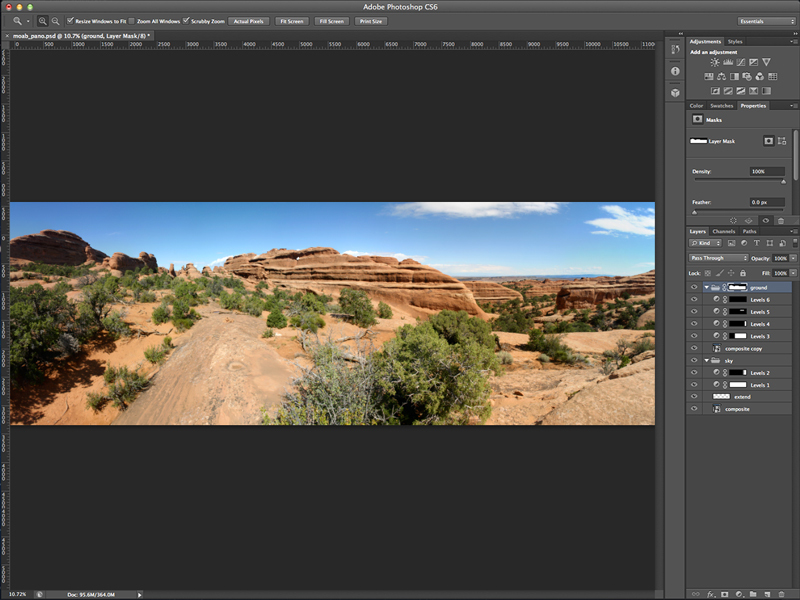 The Photoshop toolset for creating panoramic photos. 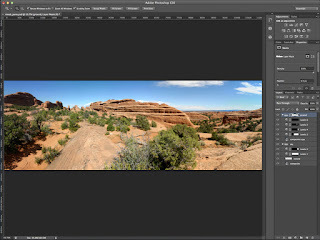 A while back I wrote about Building Photo Panoramas in Photoshop. When I wrote that blog I was working in Photoshop CS3. These days I'm working in Photoshop CS6 and let me tell you, the Photomerge feature has come a long way. I used to use Photomerge to reposition my photos only and then I would go back and manually blend the images together. I no longer subscribe to that workflow. Photoshop CS6 does a great job of blending the images as well, creating masks that hide the edges better than I ever could manually. The setting I use in the Photomerge window is Auto Layout, I then make sure that "Blend Images Together" and "Vignette Removal" are checked. I generally don't check "Geometric Distortion Correction", because of the strange horizon curves I sometimes get. A panoramic photograph showing the blended edges. I'm very impressed with the advancements in the Photoshop. It makes the process of creating a panoramic image a lot easier and the results a lot better. I only wish that Photoshop converted each layer to a Smart Object before it did its alignment - it's just my preference to always have access to the original layer. Unfortunately, there's no way to cheat it and get a Photomerge done with Smart Object layers. If you try and build your panorama from a series of Photoshop files that have Smart Object layers, you get a warning that you can not merge Smart Object documents. The Photomerge feature in Photoshop is now so powerful, I can happily live without the ability to merge Smart Object layers.